Confession: Before 2011, I didn’t know much about comic book superheroes. If you know me now, this might come as a bit of a shock. I mean I had watched Spiderman, Batman Begins, X-Men, and Fantastic Four but it was mainly for the actors and not because I was a fan of the comics. My actual knowledge of superheroes was very limited other than knowing just who the major ones were (Batman, Superman, Spiderman). I didn’t see what the appeal was in Iron Man. I mean, he’s a guy in an iron suit who flies around. Whoop te doo. Actually most of the Marvel movies didn’t really light up my radar. Then the trailer for The Avengers came out in 2011. At that point I had not seen a single movie in what is considered the Marvel Cinematic Universe. I couldn’t tell you who Nick Fury was or what Captain America’s shield was made of (wait, he had a shield?). But since there was so much hype, I figured, what the hey, let’s go back and watch the others to catch up on everything. And so I did a five movie marathon with Iron Man, Iron Man 2, The Incredible Hulk, Captain America, and Thor. Now Iron Man was cool but it still didn’t WOW me. I had seen the Ang Lee Hulk and after comparing it to the new Hulk, I’d have to give the edge to the new Hulk but knowing that another actor was going to replace Edward Norton, I was all ho hum. But Captain America and Thor. OMG. Captain America was awesome with the historical aspect, all the British people (JJ Field! ), and a hero that is actually quite humble. Then Thor was just brilliant costume drama, again with all the British people. I have a soft spot for Loki because talk about your sympathetic villain where he father practically forced him to become the way he was. AND there was a guy with a bow and arrow in the movie! So after watching all five movies, I became pretty excited for The Avengers. I really liked how they were purposely tying all the movies together as that is one of my favorite aspects of storytelling – connected threads. Therefore I soon found myself at the midnight showing on opening night packed in a room filled with so many geeks, nerds, fanboys and fangirls. The atmosphere was buzzing with excitement and anticipation. And let me tell you, that was THE BEST movie experience of my life. Have you ever experienced pure awesomeness in your movie watching experience? Where the crowd cheers, laughs, boos, basically reacts at all the right moments? When everyone applauds at the end because the movie is basically perfect? Yeah, that’s what happened that night. I was on such an adrenaline high afterwards that I couldn’t stop talking about it. Never mind the fact that it was past 3:30am by the time I got home or that I had to be up for work at 6am. For the next few weeks, I couldn’t stop recommending the movie to people. It was the perfect superhero movie for everyone, whether you were a fan of the comics or not. Even if you only liked one superhero, just Joss Whedon, or action movies in general, there was something to like for everyone. And that’s why I think the movie did so well. Wonderful word of mouth promotion. Confession: I liked the movie so much I saw it six times in theaters. Yes, that’s right. SIX. (I know you’re judging). For the record, I have never done that before, and I doubt I’ll do it again. But this was one of those movies that every time I saw it, I found something new and enjoyed it. And every showing I went to, from the first midnight showing to the $2 bargain theater on its last leg in theaters viewing, the audience was still in love with the movie. My friends have pretty much associated me with The Avengers now. 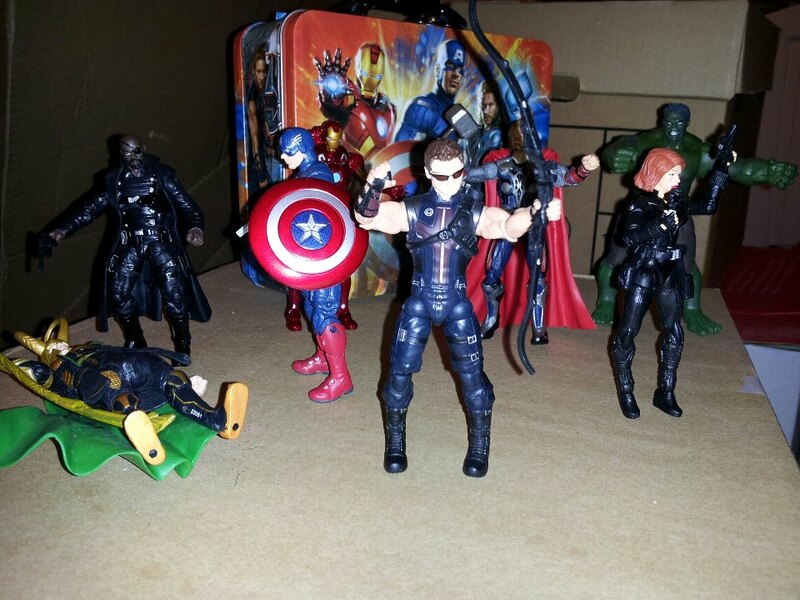 I receive Avengers related gifts for presents (hence my blog header – Christmas presents from last year). For my 29th birthday, I hosted an Avengers themed party. 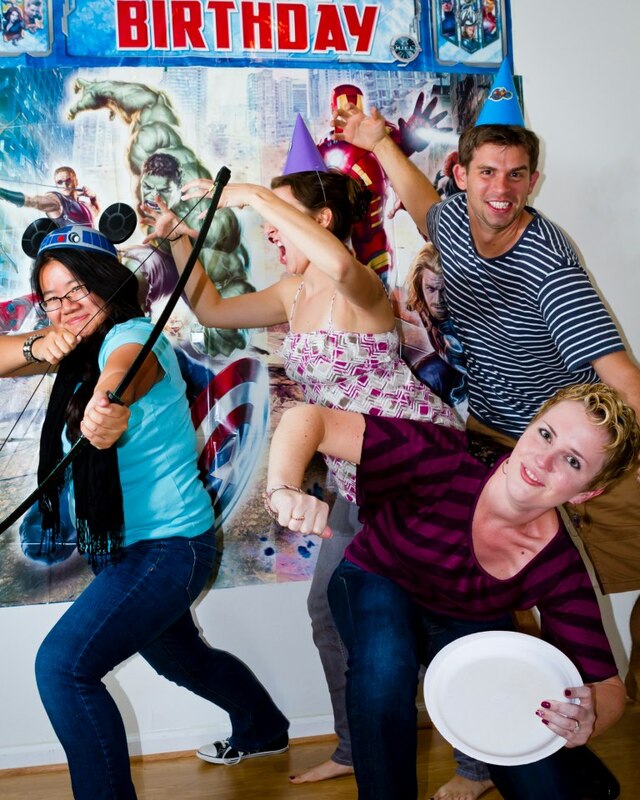 I went out to Party City and stocked up on Avengers napkins, plates, party favors, even a big banner for a backdrop. My friends will complain to you about how I played the Avengers theme song on repeat for about an hour (in my defense, I was waiting on the latecomers to the party to show up). Yes I had the same party as a seven year old boy and I’m proud of it. The movie has made me get more involved into reading the comics and learning more about these characters. It’s been a really fun time doing this and it makes me wonder how I lasted all these years before without knowing all this. Thor 2 is coming out next week and I CANNOT wait. The trailer for Captain America 2 is out as well and then there’s all the other Marvel Cinematic universe movies in the future including….The Avengers 2, where Joss Whedon announced there will be MORE HAWKEYE! Speaking of which, don’t worry. There will be a separate post dedicated to my weird love for Hawkeye.